The setting is Buffalo, New York; Jerry is out of work. He has two weeks to raise the money to keep seeing his son, but he’s got only one idea! Stripping! Well how far would you go for your kid? 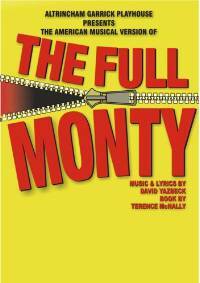 Jerry is prepared to go “The Full Monty”. All he has to do is to convince five other out-of-work guys to join him. Wives and friends said they’d fall flat on their faces and make fools of themselves. The six out-of-shape guys prove them wrong! Released in 1977, the film stormed the UK box office becoming the most successful British screen comedy. The stage adaptation won the Evening Standard Award for Best Musical. Drop everything! Come and watch them strut their stuff in this not-to-be-missed NORTH WEST PREMIERE.